Adjustable Height Cat Diner Set it at whichever height is best for your cat! NOTE: This item is currently backordered until late October, 2018. You may order one now, but your order cannot be fulfilled until the next shipment arrives. Your card will be charged at the time you place your order. This is for your protection: we do not keep your payment information on file anywhere to charge you later. 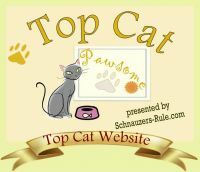 An elevated dish is very helpful for aging cats suffering from arthritis, or for cats of any age who often vomit after eating. This feeder adjusts to three heights, to accommodate taller cats, even Savannahs! Each stainless steel bowl holds up to 33 ounces (over 4 cups) of dry food, and can also be used for wet. They are removable for easy washing. Stainless steel is the best material for cat bowls, as it does not scratch over time and can be sterilized in the dishwasher. Rubber bottom prevents sliding. Charming cutout pawprint design on both end panels. Minimal assembly; hardware and instructions included. Overall, the feeder measures 9.96 inches deep x 20 inches wide x 11.22 inches tall. The top tray setting is at 10.24 inches; middle at 7.28 inches, and bottom at 4.21. Made in China of MDF with an Espresso painted finish. NOTE: Due to this items dimensions and weight, shipping on it is a flat rate of $19. This will be added to your order at checkout. Click here to shop all our Cat Meal Time products!